Jordie Benn has always dreamed of this moment. So, when he learned over the weekend that he was being recalled from the AHL’s Texas Stars to the National Hockey League, the older brother of Stars winger Jamie Benn was ecstatic to say the least. 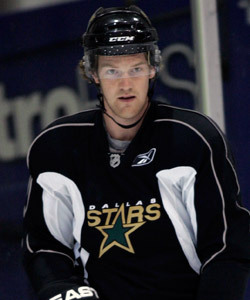 The 24-year-old defenseman had posted solid numbers (7-8-15) in 31 games down in Cedar Park and when former AHL teammate Philip Larsen started experiencing concussion-like symptoms during Saturday’s 4-2 win over Boston, the Stars had to make a move and they settled on recalling Benn from their top minor-league affiliate. Dallas assistant Paul Jerrard, who was an assistant coach with the Texas Stars last year under current Stars head coach Glen Gulutzan, is someone who knows Jordie quite well. “He’s pretty solid all around. He defends well. He’s got a good stick defending, battles hard in corners. Offensively, he’s got a really good shot,” Jerrard said. Coming to the NHL and not only seeing younger brother Jamie on the roster but also seeing two coaches he’s familiar with in Gulutzan and Jerrard definitely gives the elder Benn a comfortable feeling heading into such uncharted territory. Jamie Benn is two years younger than his brother and the Dallas winger who has 34 points (9-25-34) in 37 games for the Stars this season, is pretty stoked about seeing his older brother join the club. And it has been some time since the Benn brothers were teammates for an extended period of time. During the 2006-07 season they both skated for the junior-level Victoria Grizzles back in their hometown in British Columbia, days both Benns remember fondly. “It was pretty cool to play together for a full year and to now play together in the NHL is extra special,” Jamie Benn said. Normally, it’s the big brother’s job to help out his little brother. But with Jamie having been with the Stars for several years already and being settled in the Dallas area, this time the roles are reversed a bit as Jordie is crashing with his brother while he’s with the Stars. Besides the obvious difference that Jamie is an offensive player while Jordie skates in the back as a defenseman, there is another pretty glaring difference between these two talented siblings. At least among the media who cover the Stars, Jamie is regarded as a quiet, talented player who is more often than not a man of few words. However, it appears his older brother has a bit of a different personality. Jamie is currently in his third NHL season while his older brother was undrafted and logged time in both the East Coast and Central Hockey Leagues before making his AHL debut last year with the Texas Stars. Through it all, he never doubted he would one day realize his dream of skating in the NHL, thanks partly to some great advice from the Benn family patriarch, Randy. And according to someone who knows him and his game well, it’s an opportunity that’s definitely merited.